Here is an email conversation with Heather about a re-injured shoulder. I am sharing this (with permission) as it illuminates a common sports injury and my home care recommendations for a minor joint injury that occurs so often when we are having fun. […] I went water skiing/tubing this weekend, and my shoulder is feeling quite loose and painful. Last time it felt exactly like this was from climbing, and I had you work on it. I think you said I had stretched a tendon at the AC joint…does that sound right? Anyway, same exact symptoms…:it hurts to put a seat belt on, I can’t sleep on my right side and I cannot hang straight armed without discomfort. 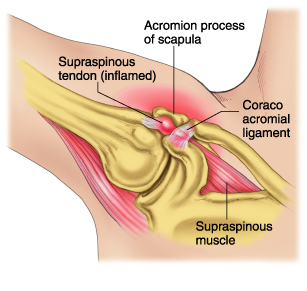 Yes, when I saw you for the shoulder thing a few years ago you had sprained the AC (acromial clavicular) joint climbing and the inflammation was squishing the supraspinous muscle that runs just underneath the AC joint – often referred to as impingement syndrome. In those jerky water-ski/tube motions it would be easy to disrupt this joint again, but difficult to seriously damage it. With a little rest and good care it should turn around in two weeks tops! (It should be notably better five days from injury and continue to heal for 2-3 weeks) So, if it were my shoulder, I would avoid things where the arm is jerked (irritates the AC), doing things overhead (squishes the supraspinous muscle), and carrying things with that arm hanging down at your side (like how you would carry an old-school suitcase – this is where the supraspinous works the hardest). I would ice the shoulder where it hurts, and at the front of the shoulder with the hand resting on your back (this exposes the squished part of the muscle). If it is not 50% better by 7 days post-injury, let’s take a look at it. We can release the guarded muscles around the AC joint and treat the supraspinous muscle and the ligaments of the AC joint so that they heal. I often see clients with acute impingement syndrome caused by non-typical activities such as painting the ceiling or picking apples. If shoulder discomfort develops over a few hours after atypical (for you) arm activities, not a trauma, especially an activity involving overhead work or repetitive jarring it is likely you have a mild case of impingement syndrome. A few days of gently care: rest, ice and muscle therapy, should be all it takes to get it back on track. This entry was posted in Shoulder, Sports Injuries and tagged AC Joint, Impingement Syndrome, Shoulder Injury, supraspinous by focusbodywork. Bookmark the permalink.